(Nov. 12, 2003) - The battle for Gay Games VII has resulted in an impasse between the Federation of Gay Games and Montreal 2006 at the Federation’s annual meeting, held this week in Chicago. By Monday, Montreal reps released a statement calling Nov. 10, "a day of mourning," and that their disputes with the Federation were beyond reason. 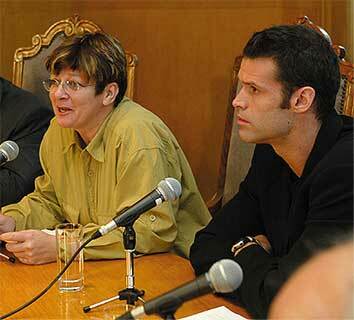 "The federation will take away Montreal 2006’s right to host Gay Games VII in 2006. We realize now that it is time to break with the past and with an organization that ultimately represents little more than itself, with only 21 of the 1000 sports teams around the world being FGG members." Negotiations over contracts, budgets, and registration limitations have led to harsh disagreements between the winning bid city and the governing body of the quadrennial GLBT sports event. Federation officials demanded that montreal reduce their proposed registration limits to 11,000. Montreal reduced its estimates from 24,000 to 16,000, but said that to go any lower would effect a successful financial plan. The negotiations, usually conducted privately, have become public in GLBT and mainstream publications worldwide. The discord will result in Montreal hosting a gay sports event that is not the official Gay Games, leaving the Federation to decide which alternate city will host Gay Games VII. Atlanta has already offered a revised bid. Los Angeles and Chicago may also be contenders. In a press statement, Montreal reps said, "It remains unacceptable that the FGG still wants to impose unbelievable financial controls while they have no responsibilities, nor on gathering the money, nor legally, because these two matters belong to the Montréal 2006 Board of Directors. The FGG, as Montréal 2006 is now used to, also suddenly put forward new demands." Among those are accusations that a just-released survey, with statistics and opinions of prospective participants, violated clearance rules from the Federation, which aims to monitor announcements. Montreal representatives said that, as a result, the host sport organization, Équipe Montréal, was barred from attending several meetings related to the negotiations after releasing the survey results. According to Montreal reps, the co-presidents of the two working committees of the Federation, the committee in charge of members and the committee overseeing policies and procedures, had withdrawn Équipe Montréal's rights to participate in discussions concerning the Montréal 2006 Games during the annual meeting. Équipe Montréal, whose group has had Federation representatives since 1993, publicly supports Montréal 2006, but denied any conflict of interest. They denounced "a unilateral decision which it judges to be unacceptable coming from an organization that claims to be democratic." "It astounds us that we are being reprimanded for supporting our own city, province and country when we are the initiators Montréal's application for the 7th Gay Games," said Daniel Vaudrin, president of Équipe Montréal. "We wholeheartedly reject this anti-democratic non-representative inequitable process that rules within this federation, which leads us to question the good faith of the federation," Vaudrin added. "Before passing judgement on the actions of an individual or an organization, it is only natural to give us the chance to respond. It's a fundamental principle of any democratic organization." A Federation statement said that Montreal reps "walked away" from the Chicago meetings, unsatisfied with new limitations imposed by the Federation. "We deeply regret that Montreal 2006 made the decision to walk away from the negotiations which were planned with the best interests of future Gay Games participants in mind," said Federation co-president Roberto Mantaci. "The Federation made multiple concessions to Montreal 2006. We are confident that we tried everything we could to reach an agreement with them while remaining true to our stated obligation towards safeguarding the fiscal responsibility by Gay Games hosts." But Montreal’s version of the Nov. 7 events differed sharply. "After being given only 12 minutes to be heard during yesterday's all-day assembly, after all those efforts ... the FGG returned with clauses that Montreal 2006 had already repeatedly rejected and, more importantly, the FGG has continued to demand the full financial control of the 2006 Games," said Montreal 2006 organizers. In previous Games, Federation members served as advisors, and did not attempt such controls, nor did they contractually have fiscal responsibilities. But the past four Games have lost increasing amounts of money, and Sydney’s Gay Games VI, while praised for its accomplishments and inclusion of Southern Hemisphere participants, eventually went into bankruptcy. Federation board members have attempted to reign in spending in advance, to curtail what they predict may lead to another financial fiasco. Canadian reps for Montreal 2006, while having assured the federation of their fiscal plan, and having spent over $1 million to prepare for the event, they never made any partial payment of the $655,000 licensing fee to host the Games. Having already raised up to $5 million Canadian dollars in funding and licensing for television rights, Montreal is prepared to host their GLBT sports event in August 2006, which will not be called "Gay Games VII." "Regardless of the outcome, there will be games in Montreal," said Tom Czerniecki, marketing and communications director of Montreal 2006. "This is very disappointing to us," said Kathleen Webster, co-president of the federation. "We’ve been working for two years to bring the Gay Games to Montreal, and if they don't want us, I wish they'd let us know sooner." Said Montreal 2006 Co-President Mark Tewksbuy, "With the wealth of support already received from athletes around the world, we know that we will be able to host Games on the scale they deserve, and for the first time in close to twenty years, in a financially responsible manner." The Équipe Montréal survey predictably showed that the majority of potential participants would be from the United States. But whether the results of the Chicago meeting will effect those numbers remains to be seen. All articles copyright 1996-2003 Jim Provenzano/Bay Area Reporter. Do not copy or post without written permission. Most images copyright Jim Provenzano, unless used in an editorial context.